Of course, it doesn't do everything (if it did everything then there'd be no need for MailRaider 2 Pro), but if all you need to do is open Outlook files, retrieve their attachments, and convert them into more accessible formats then look no further. 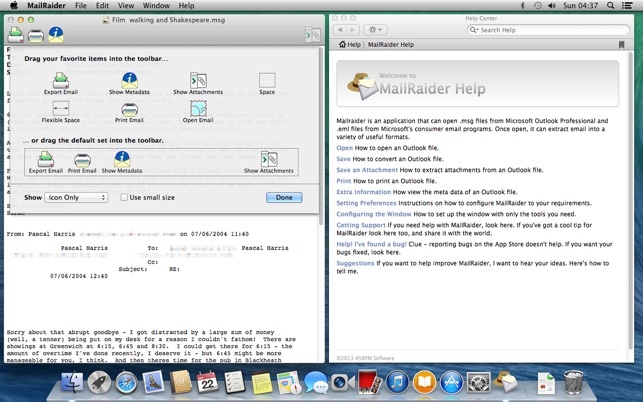 MailRaider 2 is the best value software for opening Outlook messages on the whole App Store. Please note - if you need to preserve formatting, use Spotlight (to search inside your msg files from Finder) or use Quicklook (for a quick preview of your msg files), you need MailRaider Pro. The standard edition of MailRaider does not have this functionality - it displays email as plain text only. If you discover an Outlook .msg file that MailRaider won't open, please get in touch. Sadly, leaving a grumpy review here won't solve the problem. If you're serious about getting your problem solved then you're going to need to send me a problem report (full instructions for doing so are in the extensive MailRaider help files). I do respond to bug reports, so don't worry - you aren't wasting your time. I forgot I’d had this app when a client sent me a bunch of .msg files from Windows Outlook with both text and photos I needed for a job. Mailraider opened the messages without a hitch and let me save the text of the emails AND the photos that were attached to it. Easy. Trouble-free. I saved in an RTF Archive to automatically extract the text and attachments into one folder. You can save as 3 other formats as well, but this one was what i needed. This app is a lifesaver if you have clients who forward you Windows email .msg files. Doesn’t open the msg file in anything but plain text, nor does it open any attachments. Wish I would have known this *BEFORE* I purchased the software. The information that this version only opens plain text is clearly stated in the information provided on the purchase screen for MailRaider on the App Store. 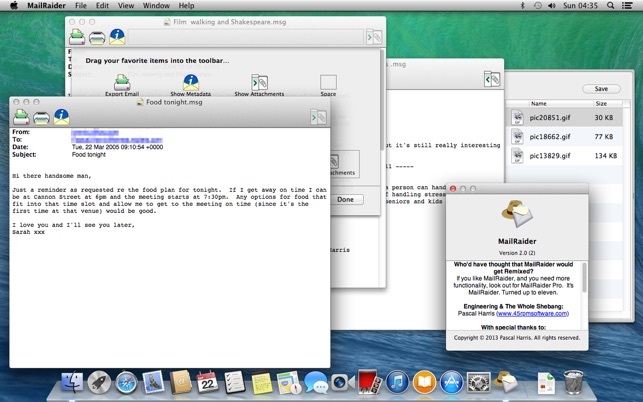 To open email, preserving formatting, you need MailRaider Pro. As to opening attachments - it does. If you're having problems with MailRaider, please email support@45rpmsoftware.com and it will be our pleasure to help you out. Can’t figure out how to get it to open my .msg files. Nothing happens when I click on them. And there’s no tech support. Guess I just donated $4 to starving software geeks. I'm very sorry to hear that you're having trouble with MailRaider - support is one of the things that we do very well though. Why don't you try emailing us at support@45rpmsoftware.com? We'd be delighted to help you out!